I have been a frequent user of public transportation since I gave up driving in 1998. While I have to say that there have been some changes for the better over the years, there is still plenty of room for further improvement. Thank goodness for the demise of those pink mini-buses. Who can ever forget the terror rides by wannabe Formula 1 bus-drivers? Now we have air-conditioned Rapid KL buses. Seniors get a 50% discount on bus and train fares if they have a Rabbit Warga Emas card. We are also grateful for the free feeder buses e.g. 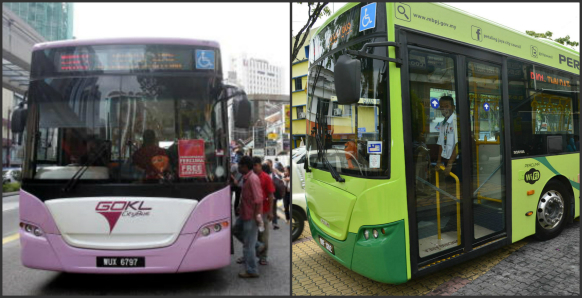 GoKL buses and PJ buses. Free shuttle buses are such a boon to seniors in terms of savings and convenience. Senior citizens are probably the largest group that rely on public transport to get around. Board a bus any time of the day, and you can see the passengers are mostly retirees, pensioners and the elderly. The government wants more young working people to use public transport in order to reduce the traffic congestion on our city streets. But why are they reluctant to do so? For that matter, many of my senior friends who are used to driving themselves around are also loathe to use our buses. Free transport or half fares are not appealing enough, apparently. I beg to disagree with Dato Sri Idris Jala, CEO of Pemandu, the unit in the PM's department tasked with implementing the Economic Transformation Programme (ETP). Introducing elevated bus lanes is not the answer. Neither is increasing the number of buses. As long as potential riders have no clue where each bus goes, they will hesitate to board a bus. The problem lies in the lack of information regarding bus routes. Go to any LRT or bus station, I can bet you won't be able to obtain a map of the train/bus routes for your personal reference. I have been trying for the past ten years. Each time I approach the counter for a map, the stock answers I get range from 'Habis' to 'Boleh download online'. Bear in mind that most seniors are not IT-savvy, and wouldn't know how to download maps and/or print a hard copy. Make things easy, not difficult for commuters. Not an iota of infomation about the buses serving this bus-stop. You find yourself at a bus-stop, and you are absolutely at a loss to know which bus will take you where you want to go - all because there is no infomation at the bus-stop. Instead, you will find all other types of information from how to contact money-lenders to who to call to rent a room. Advertisements adorn the bus-stop, but we would rather have bus info. This bus-stop is opposite the Taman Bahagia LRT station. Contact numbers for pawn shops and all manner of stickers, but nothing on bus routes. This one is along Jalan Ampang. 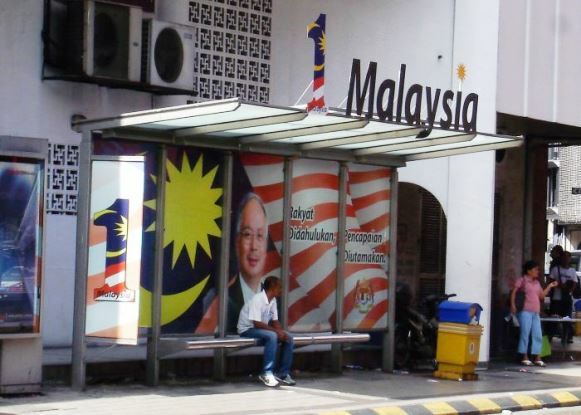 The bus stop outside the iconic Twin Towers at KLCC is an embarrassment. Definitely not people-friendly - not only is there no info, but there is nowhere to sit and wait. You can only rest leaning against the iron railing. After years of waiting, finally an electronic signboard is installed at the KLCC bus-stop that tells the arrival and departure times of buses that serve these listed areas. But is this good enough? NO! Let's say you want to go to Pasar Seni. Do any of the buses go there? Which one? Also, I have noticed that when these signboards break down, it takes ages for them to be repaired and functioning again. All bus-stops must have an information board that is locked to prevent vandalism. The board should carry info on the routes that each bus plies like in this image below taken outside Suntec in Singapore. That way, everyone, including tourists, will know which bus to take to go where they want to go. This is what commuters want - reliable information. And while I am at it, I have a bone to pick with the state of many of our public buses, especially Metro buses. Not only do many of them emit smoke enough to envelope you from sight, the seats are in dire need of repair and re-upholstering. I have gingerly sat on seats with the central foam missing and exposing a gaping hole. It's a wonder I didn't fall through! Such buses have seen better days eons ago, and should be taken off the road immediately before they become a hazard to commuters. The seat on the left is broken and held together with wires to the seat on the right. I was in the seat behind. If the wire snapped, both the lady and the seat would fall on me. SeniorsAloud has been voicing our grouses on the shortcomings of our public transport system since April 2012 in our article 'Driven up the wall by our public buses'. We have participated in working committees on the issue, met with officers from SPAD at their premises, as well as facilitated workshops on the topic. To their credit, SPAD and Prasarana have undertaken much-needed reforms in the public transport system, foremost is the introduction of free shuttle buses to serve the people of KL and PJ. But much more needs to be done, and quickly. At least no one would dare plaster ads over the PM's image. But where's the bus info? How difficult is it to provide full information on bus routes at every bus-stop? And to have maps of train routes available at all LRT-monorail stations for anyone who wants a copy? I can bet ridership will increase dramatically when such info is made easily available. I hope this blog articles reaches the attention of the relevant authorities and prompt action taken to make it a joy for the people to travel by public transport. This would bring KL a step closer to being a people-friendly city.